Many people have a list of books they read every year: Jane Austen’s Emma, Harper Lee’s To Kill a Mockingbird, Woolf’s Mrs. Dalloway. Classics. Sometimes, if a reader is lucky, a contemporary work will earn a place on the list. Mother of Sorrows by Richard McCann is such a book. Published in 2005 to critical acclaim, Mother of Sorrows is a work of ten stories that weave together spare snapshots from the life of a gay man, touching on themes of family expectations and forgiveness, growing up in suburbia, sexual oppression and acceptance, being a sissy and what happens to boys who have to hide their true nature. These are tales of American life, inhabited by a mother who’s more than a wee dramatic and overly involved, a father who is distant, and a brother who packs a wallop of a surprise (well, several) — all told by a narrator who wants desperately to make the pieces of his life make sense, but isn’t sure how. It’s a coming out story of sorts wrapped up in one hell of a family drama, fed to you in ten perfect bits that, while not linear, accumulate into something whole and very beautiful. The book opens with a scene that establishes the centrality of the mother in the narrator’s life. She’s a woman whose glamour captivates this young man, unleashing, or perhaps shaping, a path that will find him challenged by his own masculinity, femininity, desires, dreams, sorrow. She told me I was her best friend. She said I had the heart to understand her. She was forty-six. I was nine. 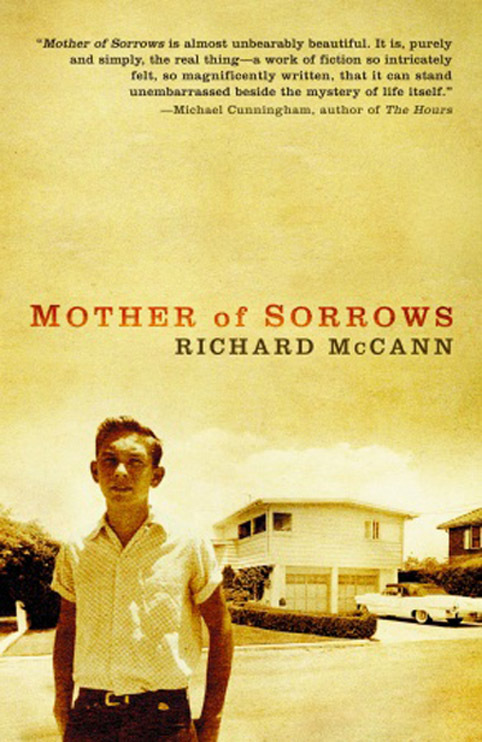 Author Richard McCann wrote Mother of Sorrows over a span of 18 years. The book blurs the line between fiction and memoir, but it’s McCann’s background as a poet that informs his writing style which is marked by a meticulous ability to say a great deal using language that has been distilled so finely as to inspire awe. At the end of each short chapter, the reader is left wondering how McCann could convey things that are so huge using so few words. McCann’s literary mastery and astute observations are what call readers back to this book to read and read again. Dear May,Thank you for your comment. Honestly, this budren of grief is just too heavy for me to bear alone. This is mainly why I also take time to talk about it, to write about it. If I don’t do this, I will most likely be overcome by it. In sharing the grief and sharing how God is helping me, I also have the comfort of the blogging community behind me. So thank you very much for sharing in my grief. God bless you! Thank you so much of the books you are sharing/recommending. I will find this one and devour it along with Jack and Lem by David Pitts. I really enjoyed the Pitts interview. I hope you PIN these. If you have, I haven’t seen them. Perhaps you should have PIN with books you recommend like all the other people. Thanks again.